For most in the horse world, Christmas hasn’t started until they’ve attended Olympia Horse Show. The 2018 show is being held in London this week (17-23 December) and promises to be as exciting as ever. As well as the show’s traditional favourites, like the Shetland Pony Grand National and the Christmas finale, the show will have top class action from across the disciplines, including the FEI World Cup Dressage competitions, proudly supported by Horse & Hound, on the Monday and Tuesday. On Wednesday the big red wall will be putting in its annual appearance, with the action turning to the showjumping and driving, on Thursday, Friday and Saturday. Come the weekend, there is also a feast of showjumping to look forward to including the FEI World Cup jumping on Saturday and the Olympia grand prix on Sunday. Find out when you can watch Olympia on TV. Horse & Hound‘s team will be on-site throughout the show bringing you the latest news as it happens. 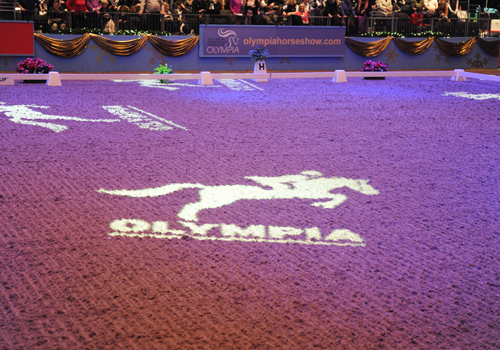 More correctly known as Olympia, The London International Horse Show, this popular festive show takes place in the capital of the United Kingdom in late December and attendance is a pre-Christmas ritual for the vast majority of the British horseworld. A brilliant place to get into the festive spirit, while also doing a last minute spot of Christmas shopping, Olympia really does have something for all members of the family as well as riders of all levels regardless of your prefered equestrian sport. The show typically takes place over seven days with world-class dressage, showjumping and driving, alongside showing and fantastic entertainment, including the fantastic Shetland Pony Grand National, the brilliant dog agility and the famous Olympia Christmas Finale. Will you be looking to qualify this season? A young German rider at his very first Olympia edges into the lead. Our products editor has rounded up her top finds in the Olympia shopping village this year. British riders fill four of the top six places in the new-look Olympia grand prix.